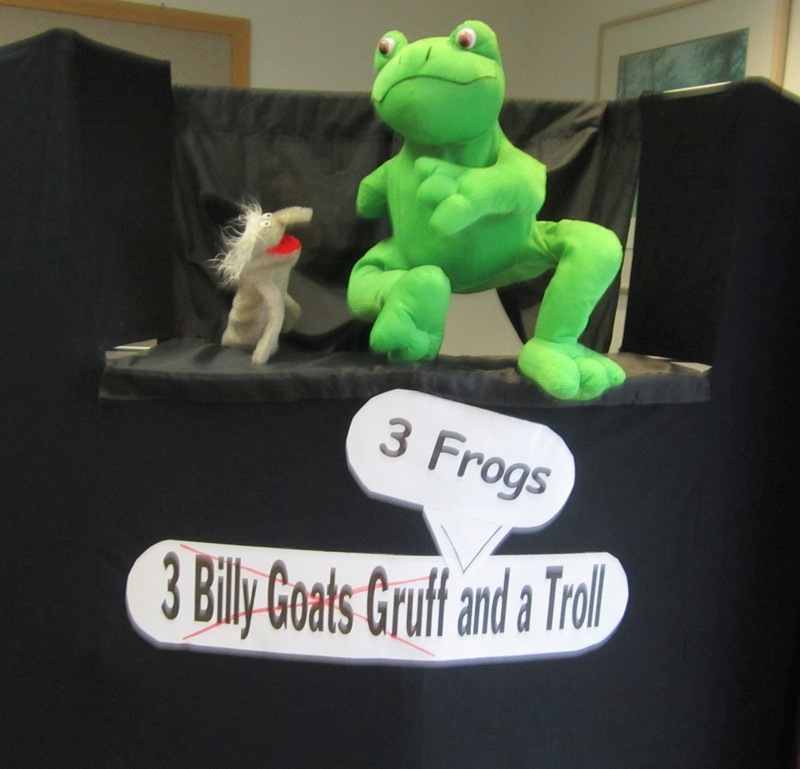 Story: "The Three Billy Goats Gruff, Three Ways"
For our annual "One Story Three Ways" Family Storytime this year, we decided to try "The Three Billy Goats Gruff. Our previous programs were "The Three Pigs" and "The Three Bears," so why not try another three-based folktale. Plus it works out nicely when we have four presenters, which we always arrange for this event (sometimes five). We always open with a more-or-less straight version of the traditional tale, just to make sure everyone knows it and will then appreciate the broader interpretations in the next two versions. Years ago Sheila made an excellent set of marionettes for the story. They have big old hex nuts for hooves, so we use a wooden bench as the bridge, which allows for some excellent "trip trapping" sounds. We add a a big blue sheet of fabric on cardboard, set up as backdrop and river, and we're set. None of us is a marionette expert, but the puppets really draw the attention of the kids. We had a simple script that gave us room to play around a little, but not too much, since we wanted to convey the heart of the tale. Next, we went for a fractured version: "Three Frogs and a Troll." I've used this for one of my Summer Reading puppet shows a couple of times ("Make a Splash: Read!" and one other from farther back in the SRP archives). It's not that different, just Frogs/Flies instead of Goats/Grass, and some silly jokes thrown in. Sheila played the troll and I was the frogs. In the past I've used a big folkmanis frog that I don't think they make any more for the biggest frog, but was pleased to see a huge stuffed frog in our library supplies. A bit of minor spinal surgery created a hand-sized opening and he became a puppet. I shortened my full script to make this fit into our 5-7 minute slot; if anyone is interested in the full script (or the shortened one) email me (sengelfried@yahoo.com) and I can send it to you. We struggled to find the perfect third version, but then we saw a cool video called "The Grumpy Old Troll" from the Happy Ape Youtube channel. It's a real catchy little song, sung by the Troll. We needed to flesh it out a bit to make the story more complete, so we added some verses, plus a bit of tap dancing. (Our version with the adapted lyrics is below.) Brad was the guitar-playing Troll. He introduces the "Who's that trip trapping over my bridge" refrain to the audience and they join in each time he sings it. The three goats comes out and sins one verse together, using the same catchy tune: "We're the three billy goats. We like grass that's green. / But this is not the greenest grass that we've ever seen. / Let's cross that bridge....and see what we can find." Then it's Goat #1 with a verse ("I'm getting kind of hungry so I guess I'll go across. / There's only one path so I won't get lost. / Trip trap, trip trap, I'm gonna cross that bridge"). Then we have a tap dance sound clip play while Goat #1 dances along. Somehow that added just the right touch. Next, Brad jumps out and sings the "Who's that trip trapping..." refrain. The Goat responds with a verse and the Troll lets the Goat go by with another. The pattern repeats with the other two Goats. We used a projected image of a bridge as a background, and that worked fine. We added a final verse to wrap it up, with the Three Goats saying: "...he should take a trip...to the grocery store!" And a new slide of a grocery store aisle appears. Then we sing the chorus together one more time. This was my favorite of our three versions. The only minor problems were when the taped-on beards of the goats kept falling out. Oh, and one of the goats fell down when he tried to mock-tap dance too fast, but I'm pretty sure no one noticed. This could be done with two people, as could the first version, if one person switches from one goat to the next. The guitar really made it work well, but it could also work with just plain old singing. Here's the adapted script we used. The tune is in the video and I'm told the guitar part is pretty easy to learn (you can click "show more" on the youtube video to see the chords). Three Billy Goats Gruff Song adapted from: "The Grumpy Old Troll"
I’ve got an empty tummy and an empty fridge. I’m waiting all day for a meal to come along. There’s some billy goats over on the side of that hill. They never come this way but I’m hoping they will. Cause I’m waiting all day for a meal to come along. 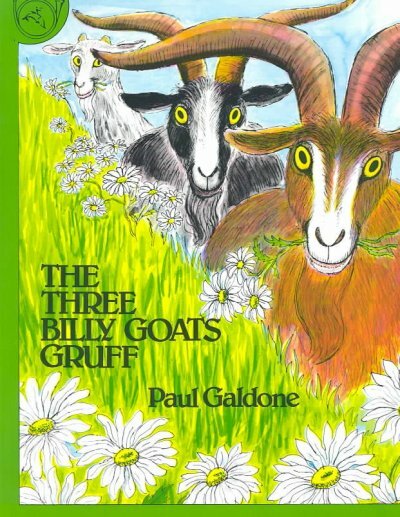 We’re the three billy goats. We like grass that’s green. But this is not the freshest grass that we’ve ever seen. Let’s cross that bridge…and see what we can find. I’m getting pretty hungry so I guess I’ll go across. There’s only one path so I won’t get lost. Who’s that trip trapping….over my bridge? I’m the first little goat. I’m lean and small. I hardly would make a meal at all. Wait for my brother…He’s a four course meal. You look pretty tasty, but I’ll let you go by. I’d rather a bigger goat, and that’s no lie. So I’ll wait for your brother…I’ll eat him instead. My little brother went so I know what I will do. I want to eat grass so I’m gonna leave too. Trip, trap, trip, trap…I’m gonna cross that bridge. 2nd Goat: I’m the second little goat. I’m a little bit bigger. Nice plump cheeks and a big fat figure. But if you’ll only wait…the best is yet to come. I kind of want to eat you but I’ll let you go by. I want to make a giant-sized billy goat pie. My brothers are gone to that other grassy hill. It’s time for me to join them so I guess that I will. I’m the third billy goat. I’m big and bold. I’ll run straight ahead and I’ll stop you cold. I’ll knock you over…off the side of this bridge. Well you look pretty big, I’ll admit that it’s true. I’m a hungry troll, but I’m afraid to mess with you. You can keep trip trapping…over my bridge. [sadly] Now nobody’s trip trapping over my bridge. Nobody’s trip trapping over my bridge. Nobody’s trip trapping….over my bridge. He's got an empty tummy and an empty fridge. He should take a trip….to the grocery store. We first got this idea for "One Story Three Ways" from The Oklahoma City Storytelling Festival. Now that we've done it for three years we realize we could easily get away with repeating these sets annually, but I don't think that will happen for a little while. There's already been some talk around the staff room about a tricky gingerbread cookie and a bread-baking hen, so I'm pretty sure we'll have three new tales for at least a couple years. 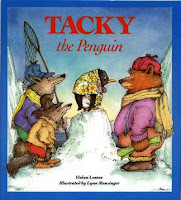 Tacky the Penguin is a perfect picture book and one of my most-used-ever books for storytimes and class visits, and I've always thought I should be able to do it as a puppet show. I have a fine Folkmanis penguin puppet and even saved a scrap of an old Hawaiian shirt so I could dress him properly...but I could never get past the need for five more penguins in the story. I thought maybe if I just used the same penguin appearing five times in a row (because they do all look alike), but no. 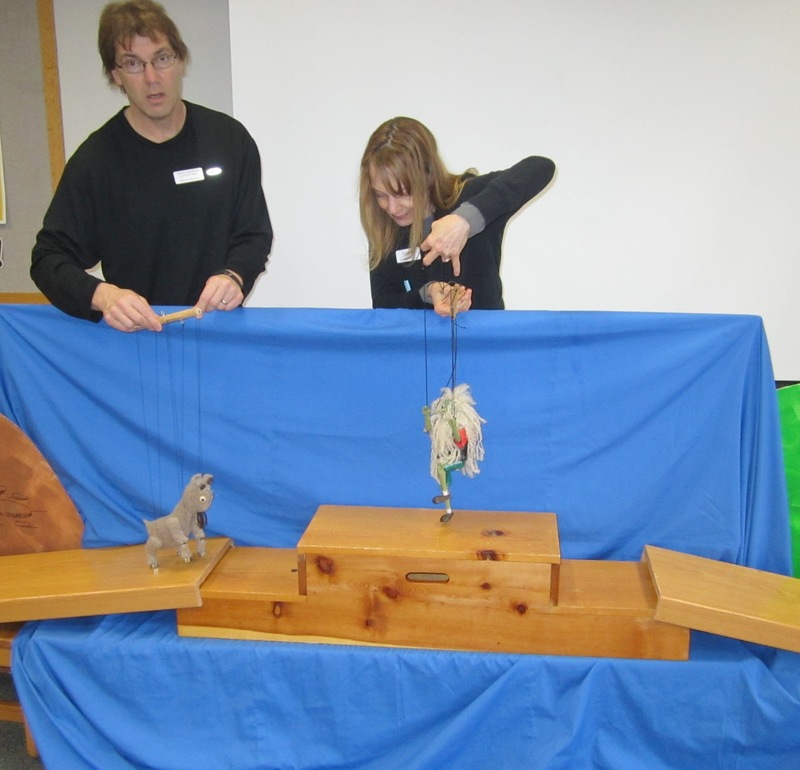 Once you add a second presenter, though, or better yet, a third one, and act it out instead of doing puppets, it all works out. I had a "Friends" themed storytime coming up and was ready to go, but Tacky got bumped for Z is for Moose. But luckily we also had a "Heroes and Villains" theme for a K-2 Book Adventure Program, and who's more heroic than Tacky? We didn't worry about looking penguin-y. 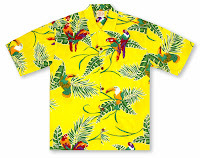 Terri played Tacky and she just needed a tacky Hawaiian shirt. I was Narrator and Goodly, then we had four kids from the audience as Lovely, Neatly, Angel, and Perfect (their names might be my favorite part of the book). We gave each kid a sign with the penguin name on it to wear around their necks. So I told the story ("Tacky lived in a nice icy land..."), and the kids did what I did: "Goodly, Lovely, Neatly, Angel, and Perfect greeted each other politely" - and we all shook hands with each other. Then it's Tacky's turn: "Tacky was different" - Terri appears giving back slaps and high flippers to us and shouting "What's Happening!" And that pattern follows, as in the book. G, L, N, A, and P march neatly; Tacky marches his own way ("1, 2, 3, 4, 2, 3, 6, 0, 2 and a half, 0.." and winds up flat on the floor....maybe that's my favorite part of the book). The five swim (and we just pretend to swim); Tacky does a cannonball (Terri yells "cannonball!" and squirts the penguins and the audience). This back and forth worked pretty well. The kids had fun being the penguins and didn't get too silly with it, so each time Terri did her thing the contrast was clear and funny. Then the hunter comes along (Sheila with a net). It's three hunters in the book, but one works fine. 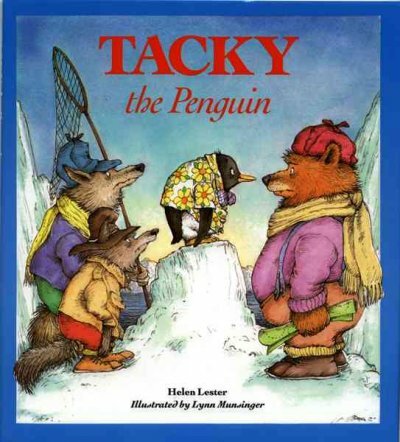 And just like in the book, Tacky repeats all the things that penguins do in his oddball style, convincing the hunter that he's not in the land of the penguins at all. The kids and Goodly, meanwhile, are half hiding behind a backdrop, then come out and join Tacky's awful song that drives the hunter away ("How many toes does a fish have? How many wings on a cow...?"). Really the only change we made to the story was to add the words "Tacky was a hero!" after the hunter was gone, just in case anyone forgot what our theme was. And of course we retained the just-right last line: "Tacky was an odd bird. But a very nice bird to have around." Our three staff + four kids cast worked great, but this could also be done with two staff, having Narrator/Goodly step into the Hunter role also, since the Hunter only interacts with Tacky. So having more than one teller really does open up the possibilities for doing act-outs and other versions of great books that won't fly solo. There is a downside though: You have to share. And it doesn't always work out that you get to do the role you really really want to do. I mean, I do like to narrate, and Terri is just great at physical comedy, so she was perfect for the title role.....but next time, I wanna be Tacky! So Jack opens in front of a scanned image of the endpapers and Little Red Hen accosts him just like in the book. The Title Page and Dedication Page are scans that "Fly Down" onto the screen with Jack responding accordingly. When Jack describes what "Fairly Stupid Tales" are, the screen shows "Fairy Tales" at first, then a few simple animations show "Fairy" changing to "Fairly" and "Stupid" getting inserted in the middle. From that point, we selected segments from the book, hoping to get the kids intrigued about the stories we didn't tell while conveying the inspired absurdity of the whole thing. So Jack tells "Chicken Licken" in a couple sentences (with a scanned illustration), skipping to how it ends, with the Table of Contents falling and squishing everyone (another scan, "Flying Down"). He mentions the titles of a couple stories, with an illustration showing for each. So we don't actually tell "The Princess and the Bowling Ball" or "The Really Ugly Duckling," but the titles and one illustration work to get a laugh and catch some interest. Then we did a little more with "Little Red Running Shorts." Wolf and Girl puppets enter and complain about the way Jack tells the story, then take off. When the puppets are gone we show the corresponding empty silhouette image from the book, then follow up with the blank page (or in our version, blank screen) while Jack silently frets about how to tell the story with no images. When Jack tells his endlessly repeating tale (to delay the Giant from eating him) we do something similar with the screen, with each refrain appearing below the previous one, in smaller print like in the book. And then we end it (after another Little Red Hen appearance) kind of like a booktalk: "The Giant comes back. And finally gets to eat something, but I won't tell you what it is, so you'll have to check out the book and read it until...The End (as those words "fly down" on the screen). We always use two people for Family Storytime and our K-2 Book Adventure, so it's not surprising that we bring in "Elephant and Piggie" stories pretty frequently. They adapt neatly to acting out because the characters have such strong personalities and the stories are told in dialogue. And although they seem simple on the surface, there's some really complex storytelling going on. Also: they're so funny. 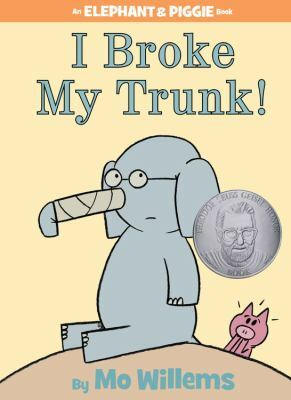 For I Broke My Trunk in Family Storytime, we followed the words from the book exactly. Well, the scripts were exact, and our script-less presentation was as close as we could get. Sheila wore a standard pig nose, and she also devised a simple broken trunk by covering a paper towel roll in duct tape (for the grey) and paper towel (for the bandage). A little awkward to wear, because it bounced up and down a bit, but I think the look was just right. Elephant tells Piggie the "long, crazy story" of how he broke his trunk, revealing one piece of the tale at a time: Balancing Hippo on the trunk; then Rhino; then Hippo's sister (his big sister); and her piano. So when Elephant says: "I had an idea. I wanted to lift Hippo onto my trunk," we showed the scanned illustration. 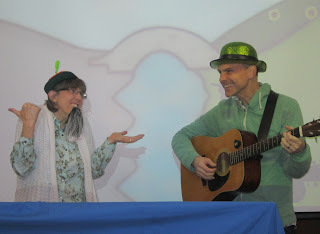 The focus was still on us as storytellers, but the image gave the kids a visual of Elephant's increasingly silly story. We put breaks in between the images, so when Elephant wasn't directly describing his feat there was just gray in the background. When Elephant's story is done (he broke his trunk not by balancing huge animals on it, but by running to tell his friend and falling), Piggie decides to go tell another friend this crazy story. So Sheila runs off behind the backdrop out of sight and shakes our bag of cans for a good loud crash sound. She emerges with a bandage on her nose. And the great closing line, when Piggie is asked how she broke her snout: "It is a long, crazy story." For some reason we struggled with this ending a bit. First we decided to prep a handful of kids to ask Piggie "What happened to your snout?" when she emerges...but by the time that moment came they had all completely forgotten and said not a word. We tried just having her walk out and show the snout...but no, you really need to direct everyone's attention to it clearly to set up the ending line. Another time it was Sheila saying: "Do you know what happened to my snout?" That worked...it still wasn't just right, but close enough. (One of the benefits of doing a Storytime four times in three days: plenty of chances to try again). There aren't that many words in the story, but you really have to get most of them right to do justice to Mo Willems' genius. The "long, crazy story" refrain; the repeated back and forth of "Is that how you broke your trunk"..."No. There is more to my story;" Piggie's explosion of "HOW DID YOU BREAK YOUR TRUNK?!" Taking your time and holding a bit of a pause before responding works well, giving the audience just a bit more time to process and anticipate. It's all great fun to perform. There's a fascinating discussion of Willems' perfectly chosen words for this story on the "Heavy Medal" Mock Newbery blog, where Jonathan Hunt makes a case for its worthiness as a Newbery contender...storytelling criteria and Newbery criteria are very different, but this book meets them both. Usually when we scan pictures and project them for a Storytime it's because the pictures are too small to see with our crowds of 120+. 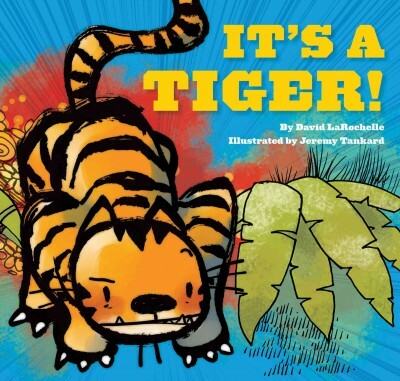 It's a Tiger is like that, but also once you put it into PowerPoint you can make some minor adjustments to make it work even better in a Storytime setting. 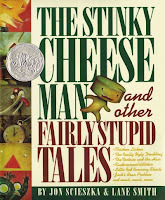 I used our scanned version of this book with a couple of class visits this week. The group size was small enough that the book alone would have worked...just not as well. 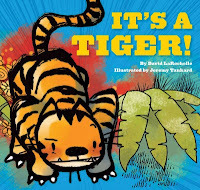 The book is kind of a variation of "Bear Hunt": We walk through the jungle, see some vines, notice that one of the vines is orange with black stripes.....than a page turn reveals: "It's a Tiger!" So lots of participation opportunities, and you can have the audience standing and running away (in place) each time the Tiger appears. 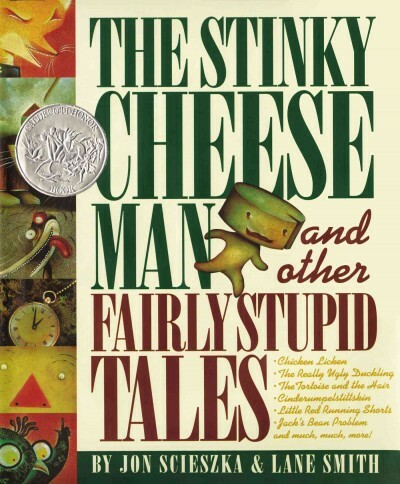 Plus the book is one of those rare gems that I always like to discover for Storytime: A good story that also counts as a "stretch," so you stick in the middle and don't need a traditional "in-betweener." Here's how our PowerPoint adaptation worked: The first scan is just the green background while I introduce the story: "We're going to go exploring. Let's start in the jungle..." Although the words in the book are just fine, I decided to just tell in my own words rather than read or memorize. Makes it more of a storytelling presentation, which feels right with this book. 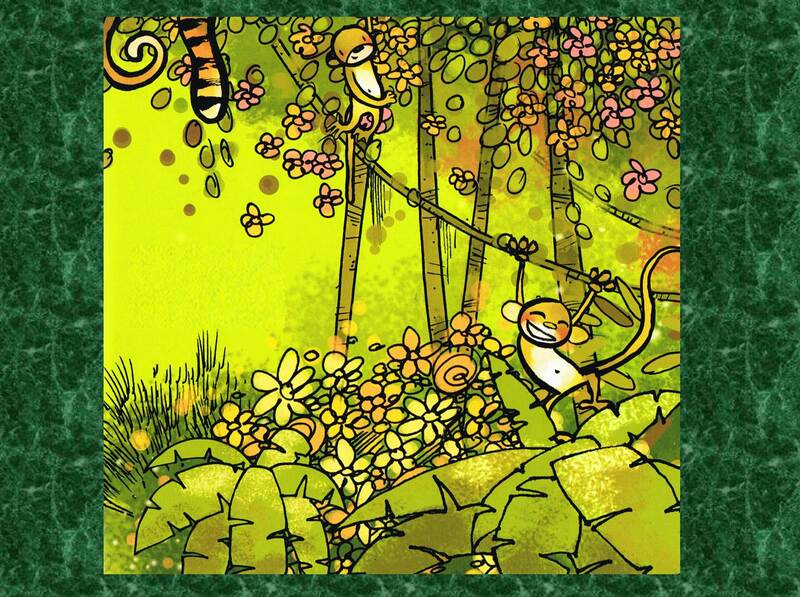 Then a click and the "Jungle" illlustration does a slow "Fly In" from the right. "Look, there are monkeys, and vines," I say...."Wait a minute! What's that?!" Then another click and an Arrow appears, pointing at the Tiger tail. The arrow isn't in the book; it's kind of the PowerPoint equivalent of pointing to the picture on the page with your finger. 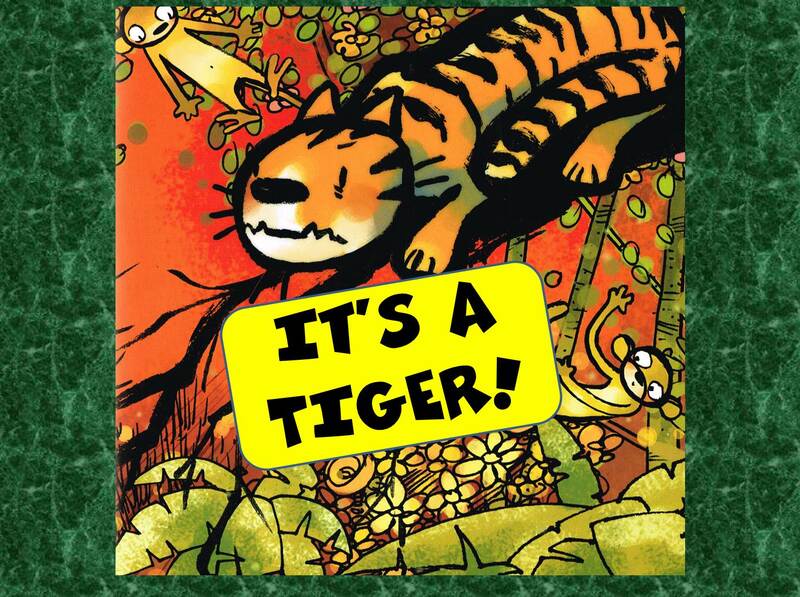 With the next click the Tiger appears, plus the added words: "It's a Tiger!" zoom in at the same time. The kids run away in mock terror, just like they're supposed to. Then here's a neat added feature from PowerPoint, which you don't get from the book: The next click brings back the green blank background, which is the kids' signal to stop. The visual cue works really well with the self-regulation that's required in a lively participation story like this. Then it's back to me for: "Let's not explore in the Jungle any more. Let's go exploring in a....Bat Cave." And the "Bat Cave" spread moves in from the right. 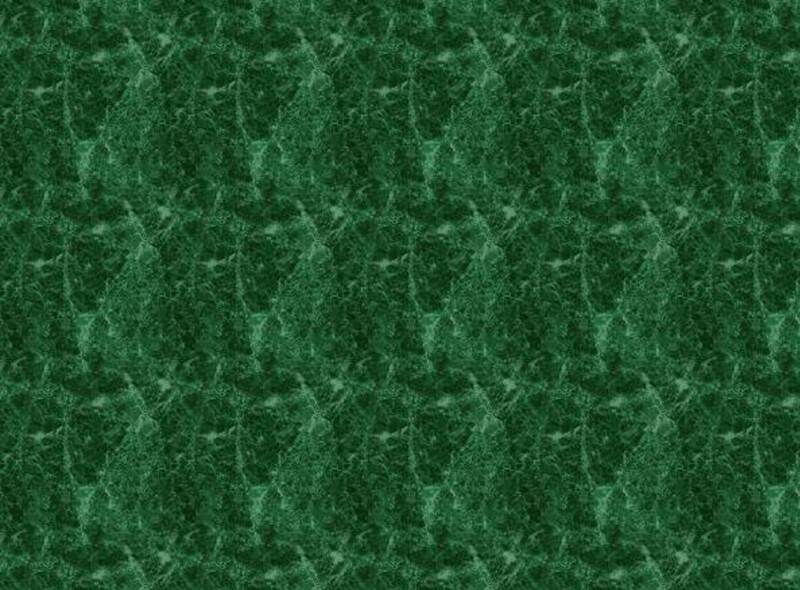 The same pattern follows as the Tiger hides among Snakes, on a Boat, and in a Treasure Chest. After the Treasure Chest I use the Green blank again to focus the kids for: "What if that Tiger is...a nice tiger?" So on the count of three we all go "Here, kitty, kitty, kitty..." and the scan of the happy tiger slowly flies in. Which sets up the ending just right: "Now that we're not afraid of the Tiger, let's go exploring again. Let's go back to that Jungle." 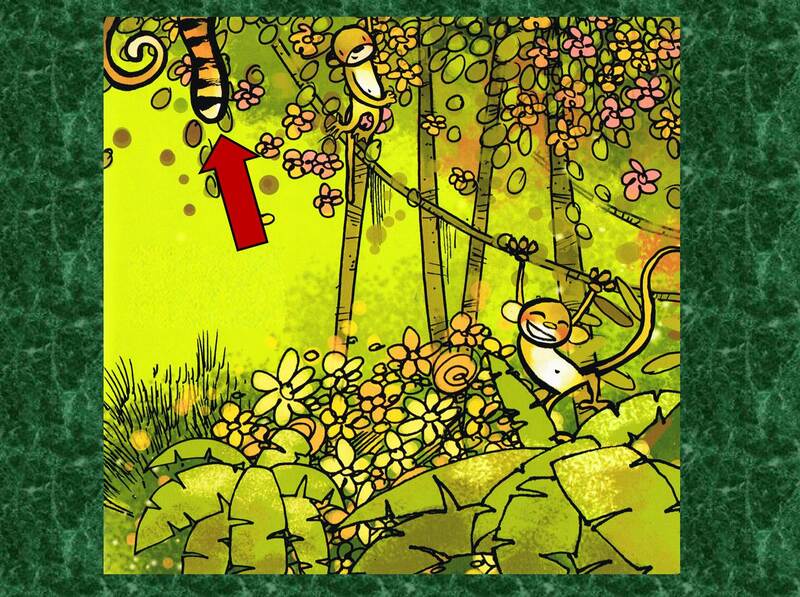 Click for the Jungle, another click for the arrow pointing at a green tail, and one more click for: "It's a Crocodile!" The kids had a great time interacting with the images, but also paid attention to me and the storytelling cues. Many spotted the Tiger clue before the arrow appeared, but that didn't detract from anything, and then the arrow ensured that everyone would see the clue in time. The second time through I realized it works great to hold off on the arrow click until you hear the first few kids spotting the Tiger. I enjoyed this so much that I want to use it in Family Storytime as soon as possible. We do themes, and with no "Jungles" or "Cats" themes on the horizon, we're going to squeeze it into "Reptiles" in a couple weeks (because of the Crocodile at the end).